I’ve been a little MIA this week; life has been busy! Tonight, I’m hiding from the cold (sub-zero cold…gross), drinking hot chocolate (this paleo one…it’s actually pretty good! ), and watching Fred Clause…and sharing with you all the random that has been in my brain lately. You’re welcome. Have you ever seen a cuter sheep in all your life? 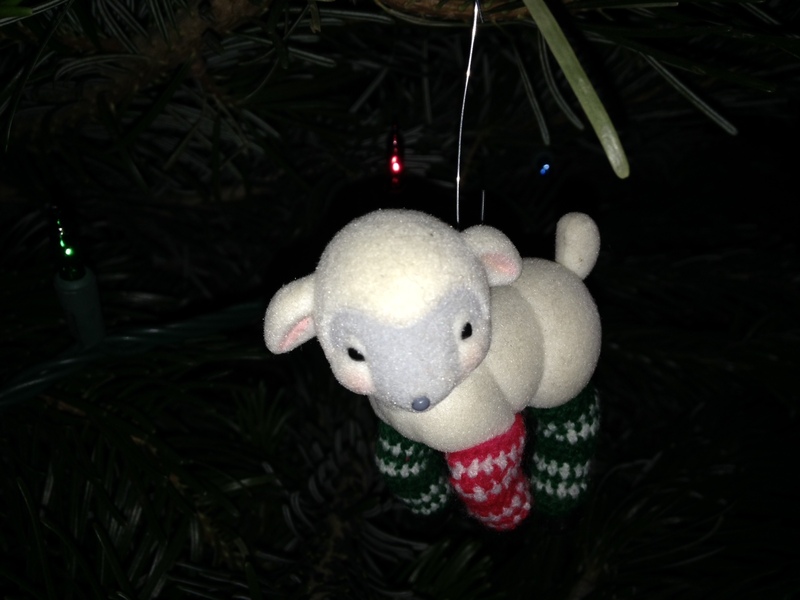 This lamb has been my favorite ornament for as long as I can remember. That makes sense, since he’s dated 1986 (and not just by the leg warmers), and I was born in ’85. Every year, he’s the first ornament up and the last down. I just love this little dude. On Wednesday, we took a group of students to see A Christmas Carol at the Denver Center for Performing Arts. It was so, so good. If you live in Denver and can get tickets, do it! I think my favorite part of the play came from the audience, though. I sat in front of one of our kids — a massive, signed-with-a-D1-football-team senior. At the end of the play, when Tiny Tim came running out on his now-healthy leg, the boy behind me clasped his hands, let out a huge sigh of relief and said, “Oh, thank goodness.” It was adorable. When most kids are little, they leave cookies for Santa. Some even leave carrots for the reindeer. Not this girl. My brother and I were true country kids, and we knew those reindeer needed good fuel to fly. We set out hay. Most kids’ parents eat the cookies they leave for Santa and maybe munch the carrots. Not mine. My awesome dad would go out in the cold night, move the hay, and make tracks in the snow with a deer hoof (Dad was a hunter; he’d save a hoof for this purpose). We would get up the next morning and see that Santa had been there and his reindeer had walked around our yard, and it was SO EXCITING. An instance of spell-check failure: A student wrote in his paper that a trip with his dad was “one of the most memorable thongs of my life.” Huh. You and your dad have a very unique relationship, don’t you? Do you have a favorite Christmas ornament? Tell me about it. Do you like live theater? What’s the best play you’ve seen? What unusual twists on Christmas traditions did/do you have? I am so glad I’m not the only person with a favorite ornament! I have a ballerina who gets put up first and taken down last each year and she has a prominent front area of the tree all to herself. My brother absolutely hates it and will move her throughout the month or place other ornaments in front of her face. It’s a tradition that I love and hate all at the same time. There’s nothing better than live theater. That is the cutest story about your students. And on the topic of cute stories, oh my! What an amazing dad you had! I love it when I read stories like that. Have a fantastic weekend! Teacher stories like the ones in this post are exactly why I love kids and teaching. We’ll ignore the annoying side for now. Your dad is so sweet to have done that for you guys. That must have been awesome as a kid.